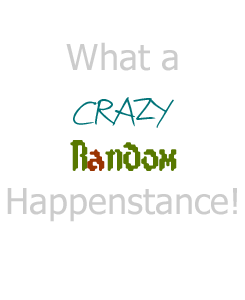 Little Miss part 2 : What a Crazy, Random Happenstance! I remember sitting there as the doctor told us all of this trying not to cry so I could listen. I knew if I cried I wouldn’t be able to stop. He even told me it was okay to cry, it was a lot to take in. He told us that she would have to have open heart surgery around 6 months of age. We would have to watch her carefully and she would have to come in for monthly check ups until her surgery. We were told that she could have blue spells due to the lack of blood flow. They were more likely to happen when she was upset. Her weight would be carefully monitored so she wouldn’t lose to much and that she might lose her appetite, all signs of her defect. For three months we watched her. Every time I feed her I cried and when she was done I sat and snuggled with her. She never showed any signs that she was sick. The only things that ever turned blue were her hands and feet when they got cold like any other baby. She ate and ate and ATE. There were times that I had trouble keeping up with her. I pumped to make my supply more and to have for bottles. She refused to use a bottle. She kept gaining weight. She gained so much in fact that her cardiologist decided she needed to have surgery early than previously thought. He was afraid that if she gained much more her heart would not be able to the strain. 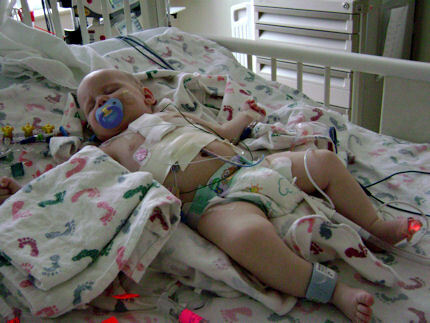 So on February 17th, 2009, four months and 7 days after she was born Little Miss went in for surgery. I had been crying and praying for all that time but when I handed her over to the nurse that day I did it without tears. J was more upset than I was. When I kissed her and said goodbye I felt a wave of peace go over me. I knew that there was nothing else I could do but have faith she would come back to me. It seemed to take forever before I saw her again. Surgery went perfectly. In fact my mother-in-law overheard a nurse say that her surgeon said it was one of the best Tet surgeries he had even done. I hated seeing her hooked to all those machines. I hated not being able to hold her. I hated seeing her in pain and miserable. I refused to leave her. J made me leave to get clean and sleep in a real bed the second night. We planned on being in the hospital for 5-7 days. (We are still grateful that we have an amazing Children’s Hospital where we live.) The first day out she was already doing better than planned. She was doing so good that we hated being so full of joy when we knew at least one little one had lost their battle in the room next to us.